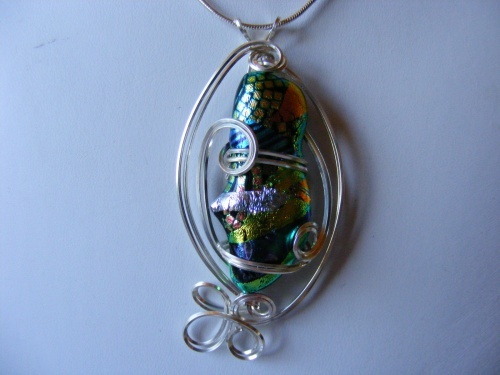 This unique and one of a kind pieces of raw dichroic glass was made by the late glass artist Rhonda Young. One of a kind, this piece has a rainbow of color so, it'll match with any piece of your wardrobe. Sculpted with sterling silver swirls you can't ask for more sparkle. Piece measures 2 1/2' from top to bottom and 1 1/4" wide. Made so bail will fit any size chain or your own omega but does come with a sterling silver chain.